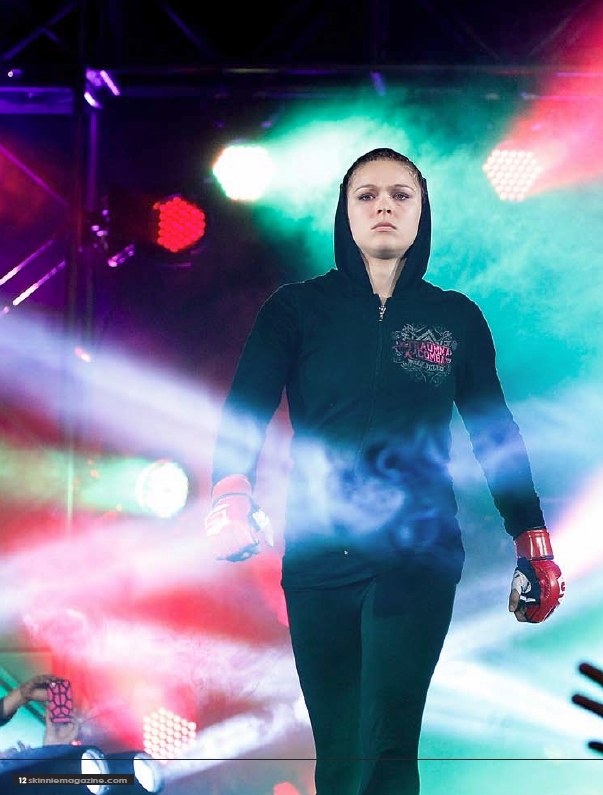 My interview with UFC Women's Bantamweight Champion, Ronda Rousey. But then Rousey, who has won all six of her fights by first round submission, armbarred her way into the collective MMA consciousness. Suddenly, the word “never” was no longer relevant as the UFC opened its cage door to women and specifically, to Ronda Rousey. How has your training for this fight been affected by all the added promotion? Not so much. I like that I’m kind of used to having the circus around because when I get to the fight itself I’m very much adjusted to it. Liz is having to deal with all of this first time; it’s going to be a lot more shocking to her, being exposed to an event of this magnitude. Whereas, I feel like I’ve been on a constant push since winning the Strirkeforce title [from Miesh Tate] last year. It was actually a garage at the country club because it started raining. It was an outdoor garage. They moved us down to the second level so they could cover the top. It didn’t seem that country-clubby; it seemed like we were in a parking structure. Two years ago, was this even on the radar, was this even a possibility? It was a possibility. That’s why I made it a goal of mine. That it would happen as quickly? 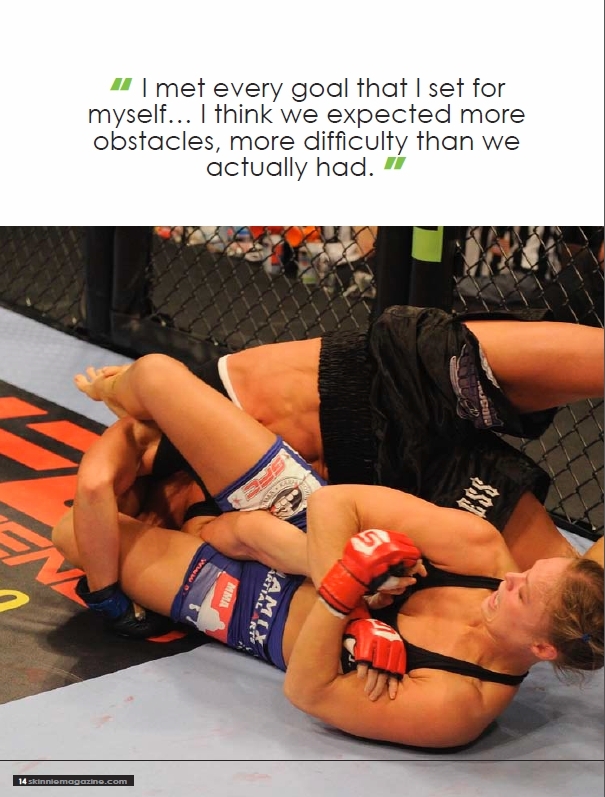 I met every goal that I set for myself… I think we expected more obstacles, more difficulty than we actually had. You’ve been on a rollercoaster for the last year and a half with all of your success, how has it changed your life? Well, I’m not driving around in a car with one working window and no air conditioning anymore, which is kind of cool. Literally, it’s much cooler. It’s a little more comfortable and a little more simple and it’s also more complicated at the same time. I feel like I have just as much work; just a more focused area. Before, I had all these different jobs, all these troubles from getting from A-to-B or just paying the rent. Now I don’t really have as much trouble with financial stuff and other jobs, but there’s so much more work required just with the fighting. It feels like I doing just as much work as I ever have. How does this experience compare with training and competing in the Olympics? I’m having a lot more fun. It’s really grueling, training for the Olympics. It’s a not so glamorous, thankless position to be in a lot of the time. Think of all the five hundred or so US Olympians that go to every Olympics, but you can only name a handful off the top of your head, if that. A lot of our Olympic teams, they spend their whole life trying to get there, trying to represent our country in the Olympics, and they don’t walk away with much. It’s much harder to train for the Olympics. A lot of times you’re just scraping by… and then you end up with a handshake at the end most of the time. Which accomplishment means more to you, being the first American to medal in Judo, or being the first UFC Women’s Bantamweight Champion? Well, I’m not going to consider myself the first UFC Women’s Champion until I actually win a fight in the Octagon. So, you can ask me that question after wards and I’ll have a good answer for you. Deal. Do you consider yourself a role model for women or women athletes? I see myself as a role model to my younger sister and that’s the only person I really feel any responsibility towards. To everybody else, I don’t have total control over my public image or how I’m perceived or presented to anybody else that I don’t know. So, I’m not going to stress over something that I really don’t have that much control over. If I serve as positive role model to girls, I’m happy to do that, but I’m also not going to worry about as much because sometimes things are going to come across the wrong way. I can sit my little sister down and explain things to her and why things are that way and talk to her and be a real role model to her. To everybody else, I feel like I can’t really do that. I’m doing the best I can, but my only real responsibility is to my little sister. Do you feel the need to create any sort of media persona, like what Tito Ortiz did in the past, or what Chael Sonnen is doing now, to help promote yourself? It seems impossible to try and make a million new friends, you know? You can’t really come across make people completely understand you with a little blip of a video here or an interview there or sentence taken out of context. You can’t control it, so there’s going to be a persona created whether you want to or not because it’s impossible for them capture who you actually are, so I try to make it as close to who I am as possible, but you also have to embellish a little bit to make it entertaining... Regardless of who you are, a persona is going to be created. How is it training for someone who you seem to like and get along with versus someone like Miesha Tate where there was animosity? Does that change your training or your approach to the fight? No. Me and Sarah Kaufman were totally cool too. I didn’t have a problem training for that either. It was one of the best camps ever and [now] I’m in the best shape I’ve been in my entire life. I’m completely emotionless when I fight. I don’t have an opinion about anything and so whether or not I like the person doesn’t really have anything to do with it. If you have a day of no training, no media, no interviews, what would an ideal day be for you? I would be on my couch with my dog not talking about myself once [laughs]. I’m fed up with me. On my days off, I don’t want to hear it. I don’t want anyone to ask a question about me. I want to sit on my couch with my and watch something about zombies. Sublime is my favorite band. I’m not really into one genre over another. Good music is good music, regardless of what genre it is, but I gravitate more towards alternative. You know what, when I was the Beijing Olympics, I would watch Fight Club over and over and over. I love that movie!